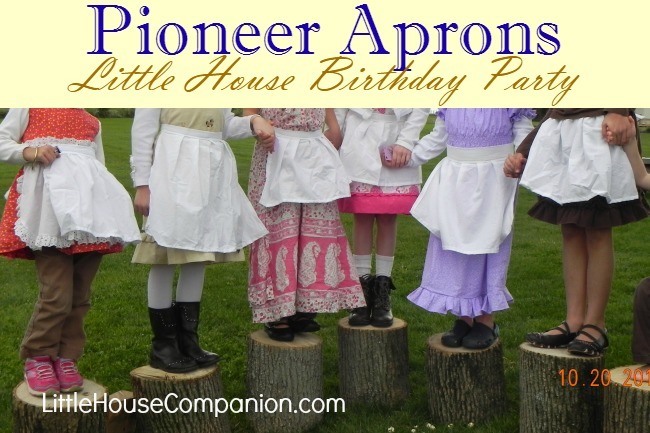 When my daughter chose a Little House birthday party, I explained to her I would make her a pioneer dress if she would also use it as a costume for Halloween. It was her idea to add the pioneer bonnet. I surprised her with the pioneer apron. We turned the pioneer dress, apron, and sunbonnet into a Laura Ingalls Wilder costume by adding felt braids. 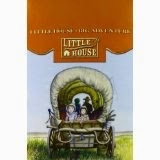 If you are looking for a pioneer outfit, but have minimal sewing skills, you can certainly make the apron and sunbonnet. The dress dress is just a bit harder. If I can make it, so can you. When I found a tutorial for a peasant dress that looked easy, I decided to make it. If you look closely, you'll see that it is not a pioneer dress; however, it is a bit old-fashioned. Big Sister wore the dress to school, church, and just for fun. As I looked for patterns easy enough for me to make, I was also looking for a dress she could wear without it looking like a costume. 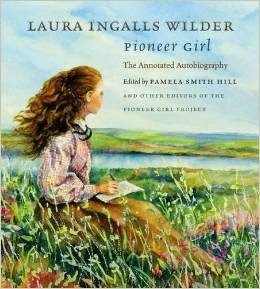 I opted a simply-designed dress, even if it wasn't true pioneer style. We chose the fabric together. I wanted a simple and pretty calico. Once again, the lavender may not be a pioneer color, but she loved it. If you look at the pattern, you'll see the sleeve length can be adjusted. These sleeves were ten inches long before sewing. I would make them even longer next time. I had never worked with elastic thread before. It was a bit complicated. I learned about it here, though I certainly did not master it. 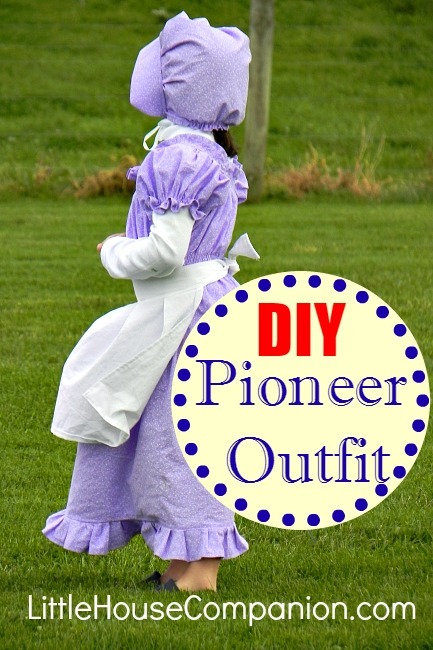 This pioneer dress's pattern provided me the chance to sew my first ruffle. I was surprised at how easy it was. It turned out well. Sewing the dress actually was easy...except that as seen in the photo below, the neck was much too large and fell off her shoulders. I added extra rows of elastic thread. I also placed tucks all around the neckline to make it fit. This is what made it complicated. 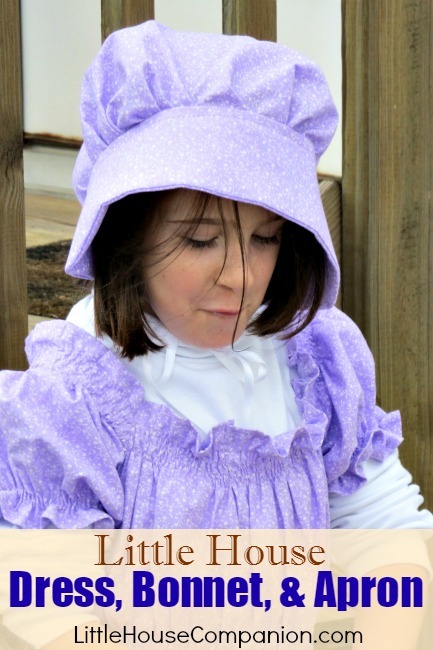 This sunbonnet tutorial is straightforward and simple. I love how the bonnet turned out. I used white ribbon for the ties for simplicity. It was very easy to make. I also made a simple apron for all of the girls attending the party. For some aprons, I gathered the main portion in advance, like a ruffle, before sewing it to the belt. For other aprons, I pinned tucks and then sewed. Since each apron was unique, I placed name tags on the aprons so the tallest girl did not get the smallest apron. Do you ever dress in period clothing? I haven't, but would love a pioneer outfit.